Genetic genealogy is a useful new tool for genealogists, especially for those who are willing to share information and participate in an interactive community. Our DNA code only means something when we share it with other people, both in our bodies and in the virtual world. We can infer biogeographical ancestry to some extent by comparing our DNA with that of reference population samples, but sharing information with "genetic cousins" may be more helpful when it comes to filling in the gaps in our family history. Product developments are customer-driven to a large extent, since the suppliers may be experts in genetics but by and large they are not experts in genealogy. I have tested my DNA with three different testing companies based in the US: Family Tree DNA (founded 1999), DNA Tribes (founded 2006) and 23andMe (founded 2006). Out of the three companies, at this stage of the game I would recommend 23andMe first plus Family Tree DNA if you can afford both. Unfortunately 23andMe does not ship to South Africa yet, so South African residents must order via a personal or commercial US-based postal intermediary such as Shipito. I have tested both my mitochondrial DNA (mtDNA), which is inherited more or less unchanged over many generations down the direct maternal line (from mother to child, but not passed on by a male child), and my autosomal DNA (atDNA), which is a mixture of DNA inherited from both parents and all ancestral lines. As a female, I do not have Y-DNA which is inherited more or less unchanged over many generations down the direct paternal line (from father to son). In theory, I could infer information about my direct paternal line by testing a male relative in that line. My brothers are not keen on providing a DNA sample which is their prerogative, but genetic cousins may be able to help me out in this regard. It is important to note that mtDNA and Y-DNA only represent the two outer branches out of many branches in our family trees, hence the importance of atDNA testing. 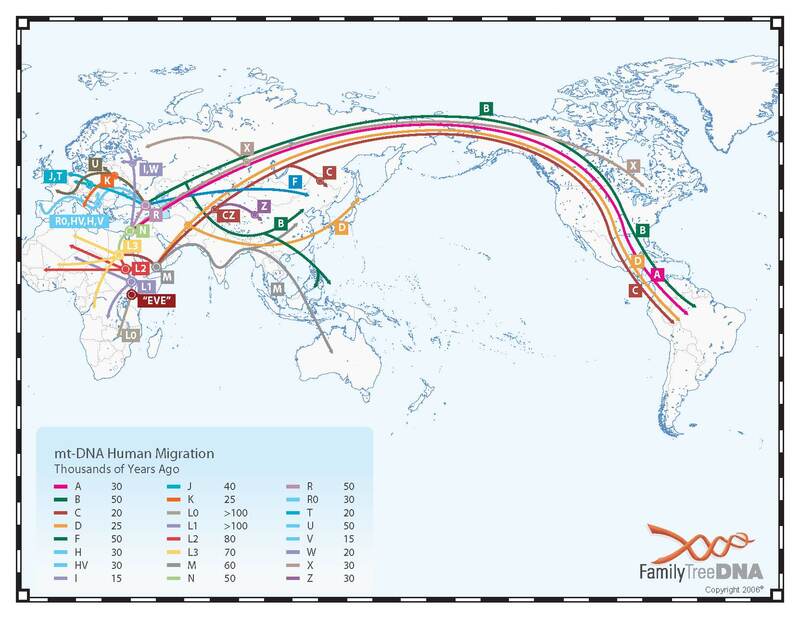 This chart shows the migration of our human ancestors from the cradle of mankind in Africa in terms of mtDNA haplogroups, i.e. mtDNA branches that formed in different geographical areas over thousands of years. Although my mtDNA results have no bearing on my paternal family history, I will include them here for the sake of interest and completeness. I have come to realize how important it is to understand all the factors contributing to one's genetic makeup when trying to make sense of atDNA results for an admixed individual. My mother was born in England to an English father and a Swiss-Irish mother. The furthest back I can trace my direct maternal line is to a Maria Holliger born in Seengen, Aargau, Switzerland c1790. My mtDNA inherited via this ancestral line is in Haplogroup V, which is a branch of mtDNA formed in Europe about 16,000 years ago. I am descended in this line from the "clan mother" named Velda by Bryan Sykes in his book about the European mtDNA haplogroups, The Seven Daughters of Eve. Velda in turn is descended in a direct maternal line via earlier mtDNA branches from Mitochondrial Eve, who we are all ultimately descended from in our direct maternal lines. "The clan of Velda (Scandinavian for ruler) is the smallest of the seven clans containing only about 4% of native Europeans. Velda lived 17,000 years ago in the limestone hills of Cantabria in northwest Spain. Her descendants are found nowadays mainly in western and northern Europe and are surprisingly frequent among the Saami people of Finland and Northern Norway." Highlight: Haplogroup V was probably common in Doggerland, an ancient land now drowned beneath the North Sea. Overview: Haplogroup V originated in Iberia during the Ice Age. After a last burst of cold conditions roughly 12,000 years ago, migrations carried the haplogroup northward along the Atlantic coast and through central Europe to Scandinavia. Today it is found in a wide variety of populations from the Basques of Spain to the Saami of Finland." Some famous members of Haplogroup V are Benjamin Franklin and Bono. Like me, they are descended in a direct maternal line from our clan mother Velda (see Haplogroups of the Rich and Famous, The Spittoon). I am not aware of any high resolution mtDNA matches, i.e. people matching me on both HVR1 and HVR2 panels tested, which is quite unusual. However, I do have quite an interesting match in the FTDNA mtDNA Haplogroup V project. One of my HVR1 matches listed there has the same mutations in the HVR2 panel as I do except for two. This match can trace their direct maternal line back to a Johanna Warnicke born in Hannover, Germany in 1835.